The River Hawks and Merrimack College Warriors skated to a 1-1 tie Saturday night at the Tsongas Center. Despite scoring first, Merrimack College outshot UMass Lowell by 20 shots, with the River Hawks putting only 15 shots on goal, the lowest total of the season thus far. Play at the beginning of the first period was rife with flurries of conflict; trippings, thunderous hits against the boards, and skirmishes near each team’s goal abound, particularly after hard-fought scoring chances. Although the scoreboard didn’t reflect it, there were many legitimate chances at scoring. The River Hawks seemed to forgo their pass-first mentality and were more eager to shoot the puck, even from the blue line. With 9:33 remaining in the period, the River Hawks got their first chance at a power play, and although they didn’t score, they were dominant in their own offensive end. Unfortunately for the River Hawks, the Warriors’ penalty-killing prowess was on full display. The River Hawks got another chance at a power play when Merrimack right-wing Ben Bahe got sent to the box for interference. Shortly thereafter C.J. Smith got sent to the penalty box for slashing, and the River Hawks and Warriors went on a 4-on-4 campaign. During this, UMass Lowell hardly left their offensive zone, staying fast through the whole thing and fending off Merrimack when they were having to go on the penalty kill after Bahe was released from the box. Merrimack goaltender Colin Delia robbed defenseman Niklas Folin with a glove save on a slap shot with 2:27 remaining in the period. 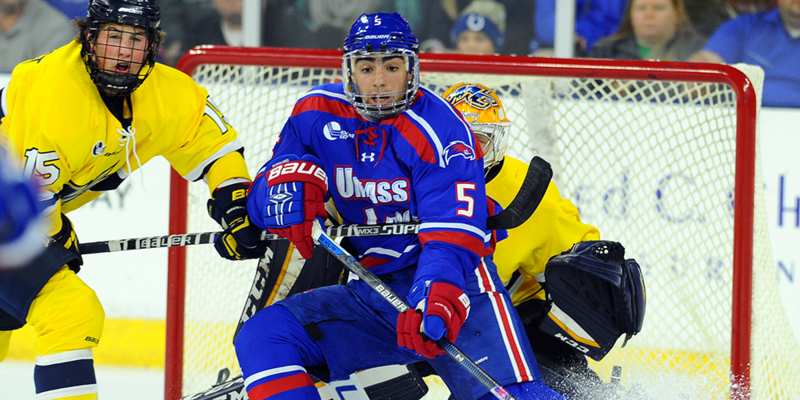 UMass Lowell and Merrimack went into the second period tied at zero. Most of the second period was quiet from the River Hawk end. Despite an early power play gained when John Gustafsson was sent off for cross-checking, the River Hawks were unable to capitalize on the man advantage—although they certainly came close when an Adam Chapie shot was deflected away from the goal. At the beginning of the period the River Hawks were shaky and hesitating with the puck. As a result, much of the second period was played in the River Hawks’ defensive end. Even with the additional pressure, goaltender Kevin Boyle stood strong in net. A high point in Boyle’s period came when he stopped a shot by Bahe with 14:30 remaining with a decisive glove save. Merrimack scored with 6:15 remaining in the second, when Boyle made the initial save but the rebound trickled in the goal. The play was put under review, but the call on the ice stood—good goal. Not ones to be deterred, the River Hawks struck back sooner rather than later. With 5:31 remaining in the second, Michael Kapla scored with a clear shot to tie the game at one. It was an open net for him, with Delia preoccupied with a tangle of players in front of him to his right, while Kapla sniped off a shot on his left side. The third was filled with scoring chances for the River Hawks. C.J. Smith had two solid chances, and Ryan McGrath shot out for a mid-period breakaway that was broken off by Marc Biega. The play in this period was markedly improved from the previous two, as noted by Bazin, who pointed out that the River Hawks had generated more offense and shown “life.” Despite a flurry of attempts to eke out a win in the final minutes, and a time-out called by Bazin with :38 left on the clock, Merrimack and UMass Lowell headed to overtime for the second straight night. The River Hawks will go on the road next week to face the No. 5 ranked University of Minnesota-Duluth on October 30 and 31.